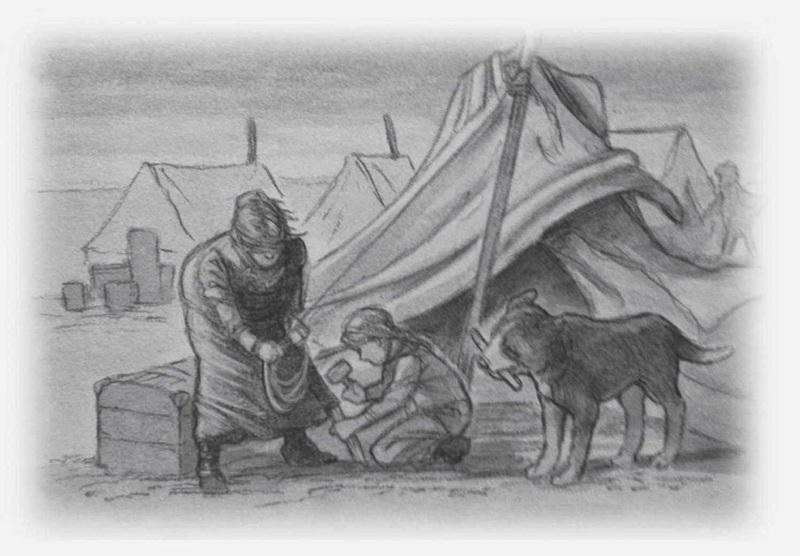 Author Alison Hart specializes in writing historical fiction for young people, and her skills at this genre are evident in her newest book, Murphy, Gold Rush Dog, the second in a recent series, Dog Chronicles, which features heartwarming stories of heroic dogs from different historical periods. 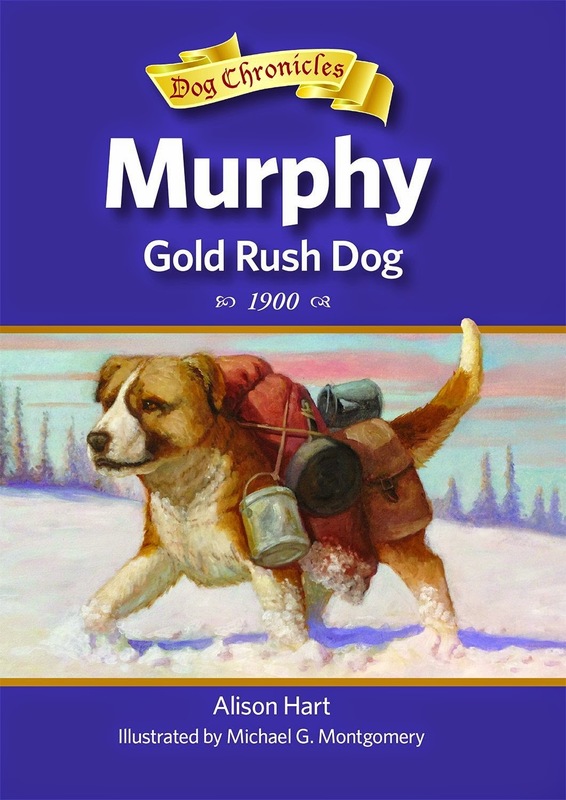 Set in 1900, this early chapter book is told in the first person by our canine hero, Murphy, a sled dog on the Alaskan frontier who's headed to Nome--and the Alaska gold rush--with his cruel master. He manages to free himself and sets off wandering through the town dreaming of "a home filled with kind words--and maybe even bacon." Could any dog want more than that? Murphy has the good fortune to be taken in by a young girl named Sally and her mother, who've come from Seattle to make a new life on the frontier--not as gold miners, but with a typewriter, which Sally's mother plans to use to type letters and documents for the miners. When the hardships of Alaska's frontier get too much for Sally's mother, she plans to book passage back to Seattle for the two of them. 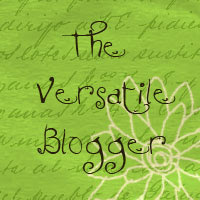 But Sally is determined to find gold despite her mother's caution that almost no one winds up rich in the gold fields. Sally decides--without her mother knowing, of course--to set off on her own to stake a claim and raise enough money that they can buy a cabin and stay over the winter in Nome. She takes Murphy with her, but can Murphy keep Sally and himself safe, with threats from wolves, grizzly bears, and harsh storms in the Alaska wilderness? As one would expect given the young audience this book is aimed at, there is a happy ending for all in store. This book does an effective job portraying the realities of the gold rush in Alaska, particularly how the young reader sees that very few people actually got rich through finding large gold nuggets. Hart peppers the text with plenty of evocative details of mosquitoes, saloons, dance halls, and n'er-do-wells of the frontier, as well as including some Native American characters who play a minor role in the narrative. 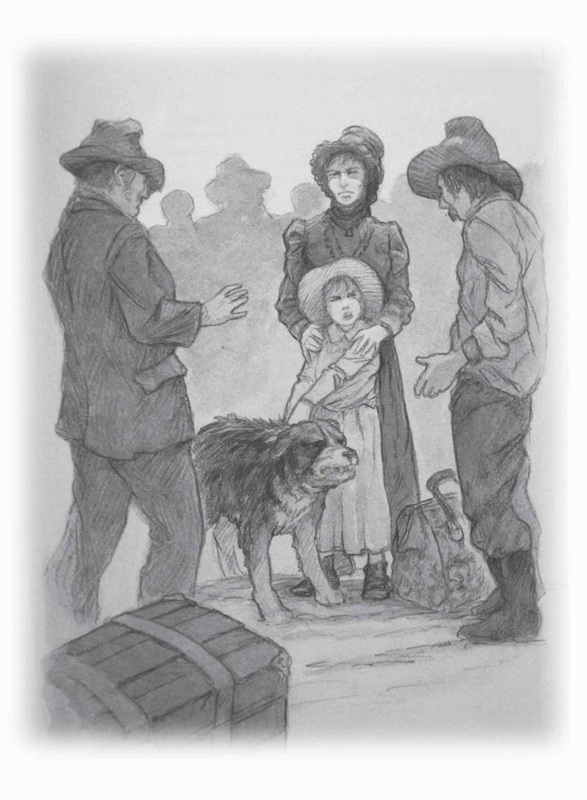 Back matter includes additional historical background about dogs in Alaska, the Nome gold rush, a brief bibliography, and suggestions for further reading. I would recommend this book to readers who enjoy historical books such as the American Girl series or the Dear America books or to those who favor books about animals. If you would like to win a copy of this book, please leave a comment below with your e-mail address! British author/illustrator Alex T. Smith returns with a winter-themed addition to his beginning reader series about the adventures of a genial dog named Claude and his best friend Sir Bobblysock (yes, Sir Bobblysock is actually a sock, an unusual sidekick--or perhaps it makes sense since dogs love to chew socks?) This is the fourth book in the series. In Claude on the Slopes, we are introduced to Claude, a small, plump dog who wears shoes, a sweater and "a rather nifty beret," and resides with Mr. and Mrs. Shinyshoes and his best friend Sir Bobblysock at 112 Waggy Avenue. In each book, Claude and Sir Bobblysock take off on adventures. One day they go to the library, where they visit Miss Hush, the librarian, who has to remind Claude to use his "nice Indoor voice." Claude is in for a real adventure when he experiences snow for the first time, and winds up at a winter sports center, where he experiences snowball fights, sledding, and snow sculpture and skiing. When he forgets he's not supposed to use his loud outdoor voice out in the snow and accidentally triggers an avalanche, his magic beret, which seems to hold everything you can need, helps Claude save the day. This beginning reader is perfect for fans of gentle humor such as Poppleton by Cynthia Rylant or the Amanda pig series by Jean van Leeuwen. The cartoon-style artwork, done in black, white, grey and red, adds to the humor of the stories. As is typical with beginning readers, the author uses a format of brief chapters which can be read independently if a child is not yet ready to read the entire book at one sitting. The book would also make an amusing read-aloud, although the small size of the volume make it better suited for reading with a small group than a classroom. 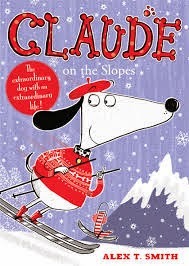 To win your own copy of Claude on the Slopes, leave your e-mail in a comment below. The winner will be selected on November 1. 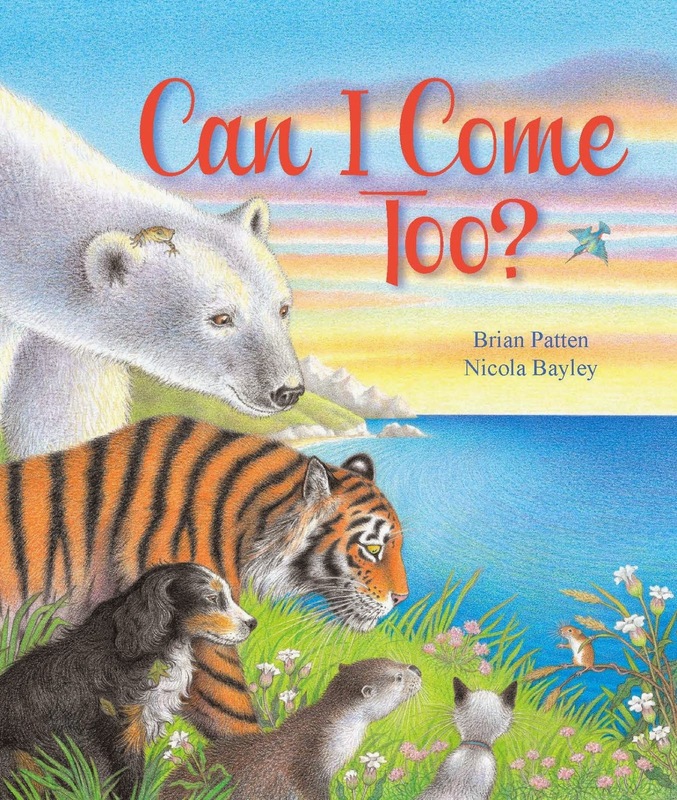 British poet Brian Patten and British painter and illustrator Nicola Bayley combine forces in Can I Come Too?, an exquisitely illustrated picture book suitable for the youngest children, in which a tiny but adventurous mouse sets out on a quest to find the biggest creature in the world. In his gentle and lyrical text, Patten turns to a familiar and beloved pattern for children's books, the cumulative tale, much as P.D. Eastman uses in Are You My Mother or Deborah Guarino uses in Is Your Mama a Llama, to mention just a few. 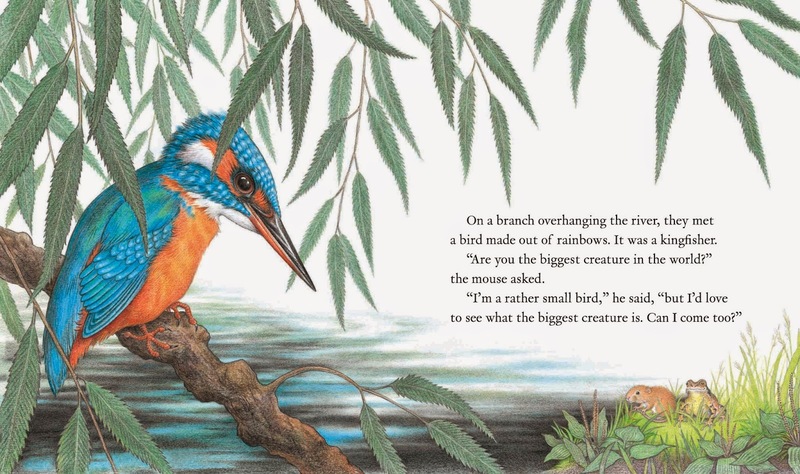 Here, our mouse heroine meets a succession of larger and larger animals, asking each "Are you the biggest creature in the world?" 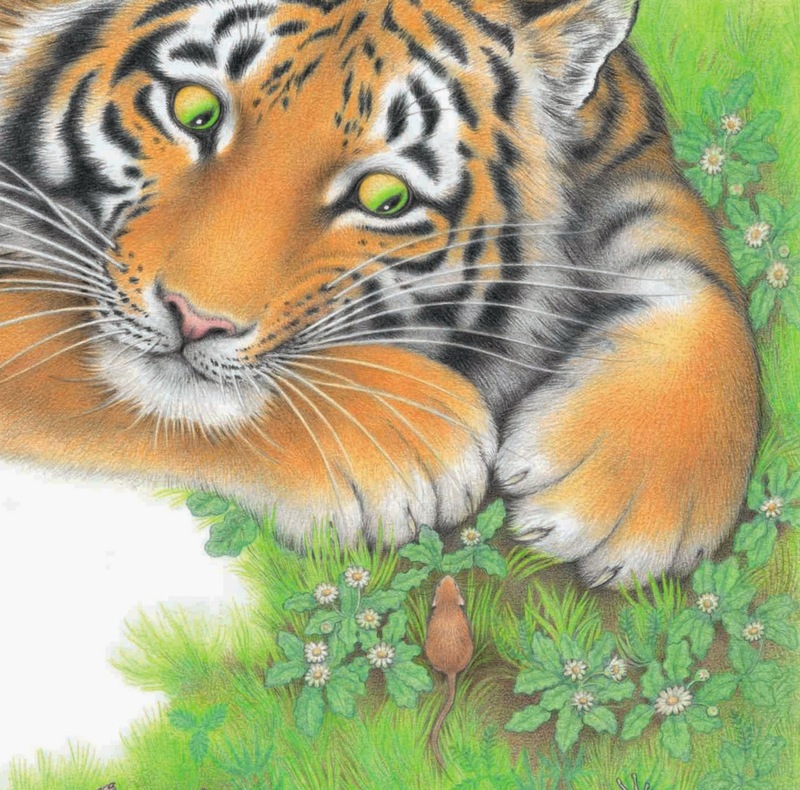 A friendly frog, a rainbow colored kingfisher, a sleepy cat, an otter, a badger, a dog, a goat, and a tiger all admit they're not the biggest creature in the world, but ask politely if they can come along on the adventure. When the story is read aloud, children will enjoy chiming in on the oft-repeated refrain, "Can I come too?" Finally, the motley group of animals, led by our intrepid mouse, meets a polar bear, who knows just where to find the biggest creature in the world. They all follow the polar bear to the ocean, where they encounter an enormous and majestic whale. Satisfied, the sleepy animals spend some time watching the whale frolic in the ocean, and then return home, where Mouse curls up and muses, "I might be tiny, but I've had a very big adventure." If Mouse's adventure makes you hungry, you can make a mouse-themed snack with instructions from Peachtree's blog! If you would like to win a copy of Can I Come Too? for your own home or school library, please leave a comment below with your e-mail address! The winner will be selected at random on 10/23/14. Cybils nominations are now open!